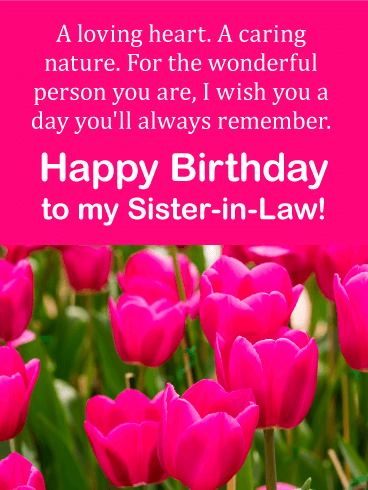 Your sister-in-law has so many wonderful qualities she shares every day, from a loving spirit to a kindness that radiates through everything she does. 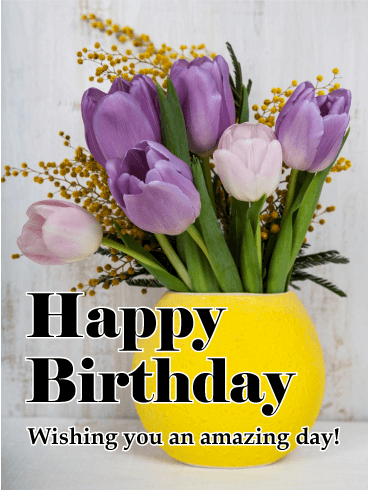 Let her know how happy you are to have her in your life with this beautiful birthday card, featuring a heart made of lovely flowers. 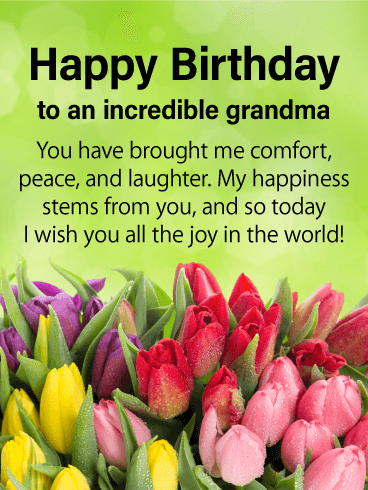 With its sentimental words and rich colors, it's sure to fill her own heart with happiness while wishing her a day she'll always remember. 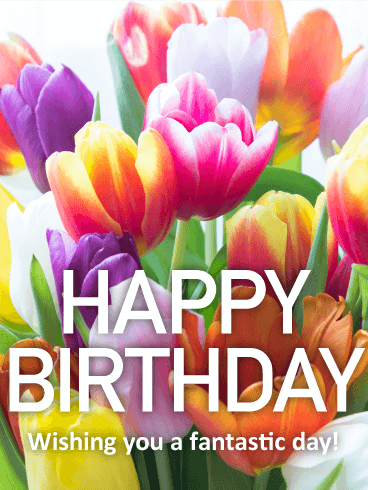 Nothing says "Happy Birthday" better than a bouquet of beautiful flowers! 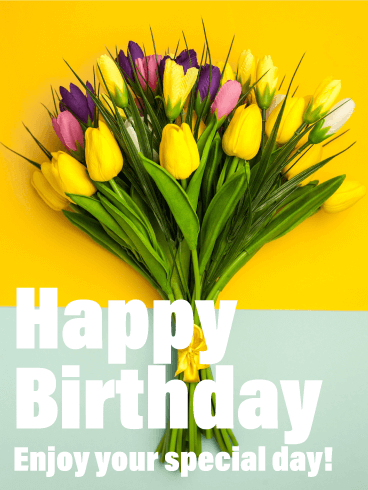 For your loved one's birthday, use the colorful flowers on this Happy Birthday card to help your favorite person have a fantastic day! Tell them how much you love them and how happy you are to be a part of their life. Make this the best birthday they have ever had! 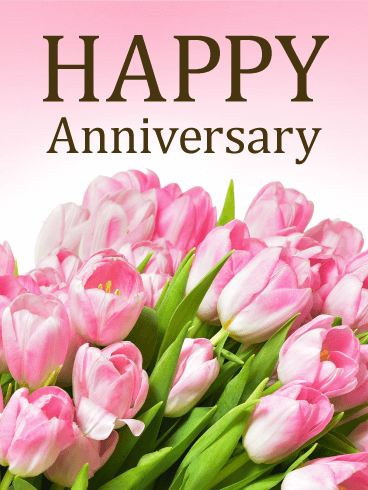 A bouquet of pink tulips is a beautiful way to say "Happy Anniversary" this year. Why not send your loved one a gorgeous bouquet straight to their inbox? Your love knows no bounds and today is a day to really celebrate all the years you've spent together. A romantic anniversary card is a thoughtful way to shower your beloved in even more love on your special day. One, two, three – I love you! These rosy tulips are bursting with affection, each one a precious gift. Over the years, your mom has gotten more and more amazing. She’s a spectacular woman with an incredible heart, and just thinking about everything she’s done for you fills your heart to bursting. 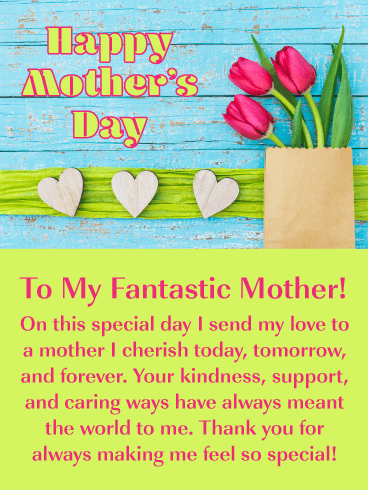 Let her know how fantastic she is and how much you love her by sending her this Mother’s Day card! 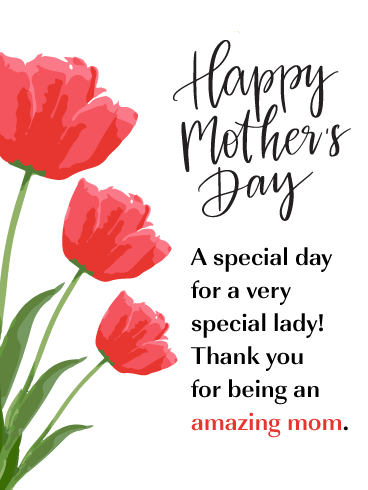 When you have a friend that also happens to be an amazing mom, you want to wish her the best on Mother’s Day. 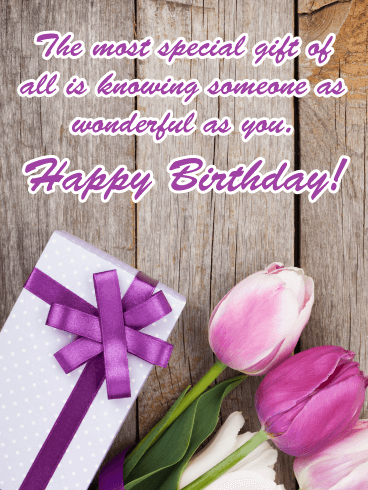 This card is the perfect way to let her know you’re thinking of her and hoping she has a beautiful celebration. 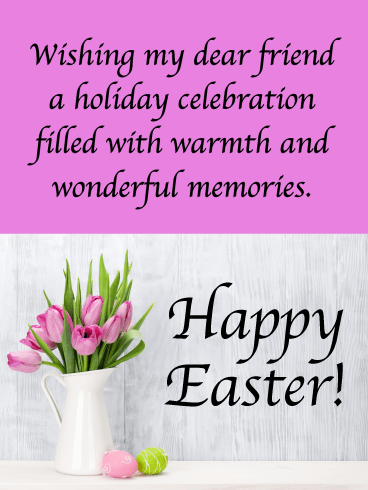 Pretty pink tulips against a pink background give this greeting a lovely and charming touch, while the words come straight from the heart. She is the heart and soul of your family. She is your partner in life and the person you love above all else. 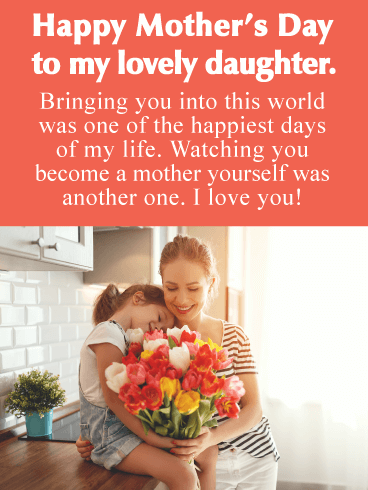 On Mother’s Day, remind your wife how much you treasure her and all the special moments you share together with this lovely card. Featuring a mom being given a beautiful bouquet of flowers, it’s a gesture sure to touch her and make her smile bright. 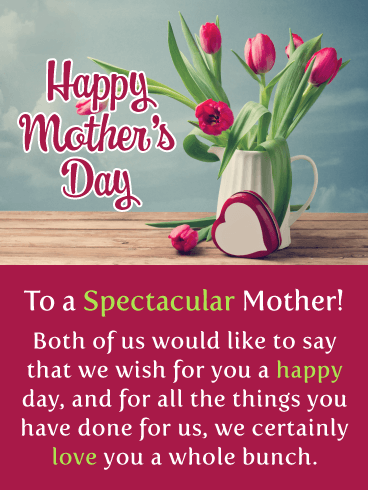 Send an outstanding Mother’s Day card out from the both of you this year, it will certainly make her day extra special. 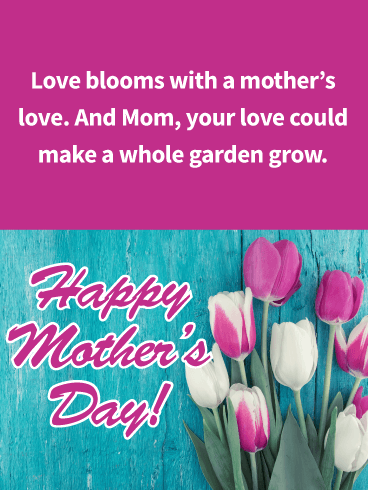 Beautiful flower and caring words fill this Mother’s Day card and make it a must-send! Your mother will be thrilled to read that her selflessness has never gone unnoticed. 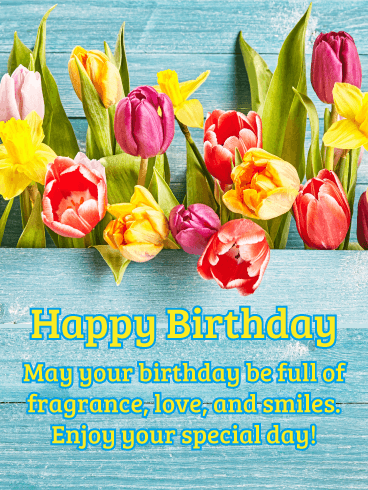 Be sure to send this lovely greeting card out soon, so she can enjoy these flowers on her special day! 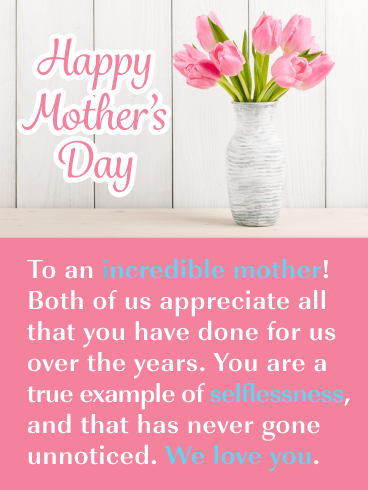 Mothers are special and deserve to be recognized for all they do. 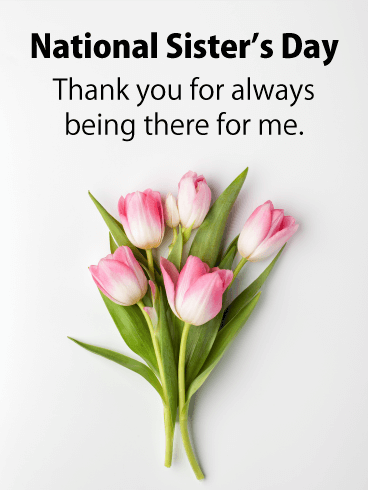 If both of you want to make sure your mother feels appreciated, send this pretty Mother’s Day card her way. It will let her know how much the two of you care. Get these sensational flowers over to your mother today so she can have a great day! You’ll remember it always as one of the happiest days of your life. The day you became a mother. Then your little girl grew up and became a mother herself. 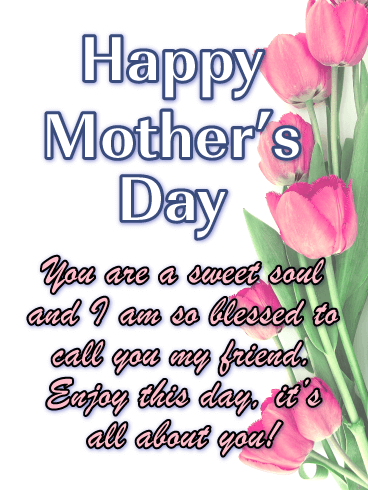 Send this tender photo card to your lovely daughter to wish that woman a Happy Mother’s Day. She’s brought such joy into your life, and you will always love her. Daughters. They have the power to make your heart feel like a flower bursting into bloom! 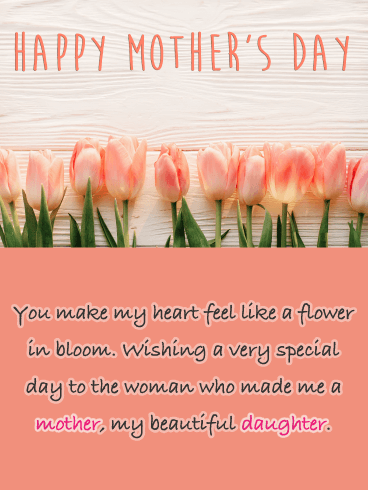 Send this gorgeous pink tulip card to your own beautiful daughter to wish that special woman a very Happy Mother’s Day. She made you a mother, and now she’s a mother, and you’re forever grateful to know that sweet soul and her own dear family. 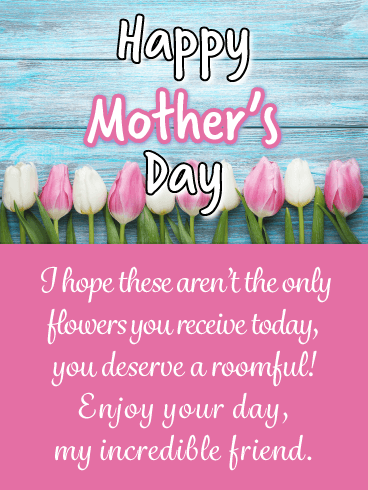 There is nothing more special than receiving beautiful flowers for Mother’s Day, and that’s what makes this greeting card so perfect. 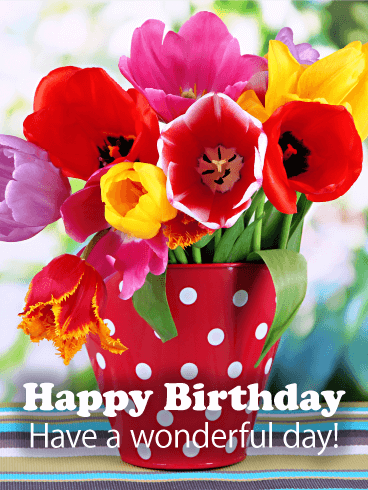 It will allow you to send your mother-in-law lovely pink tulips and a wonderful message. 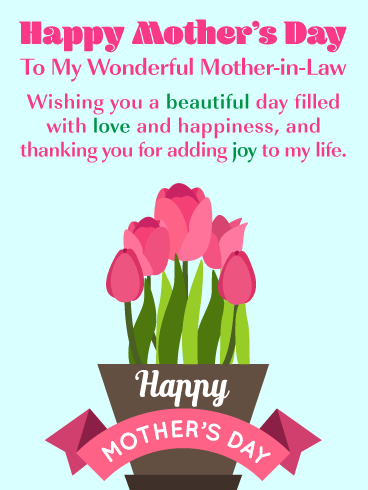 So be sure to wish her a day filled with love and happiness with this delightful Mother’s Day card. She will certainly appreciate it! 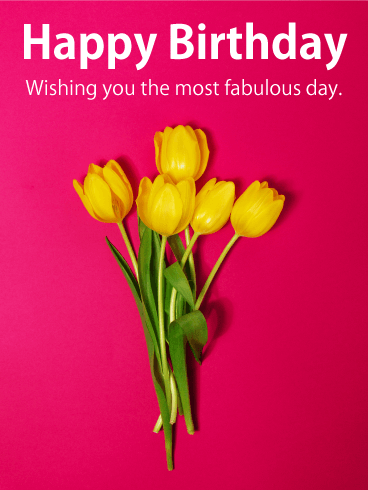 A bouquet of breathtakingly pink tulips grace the right side of this lovely greeting card. 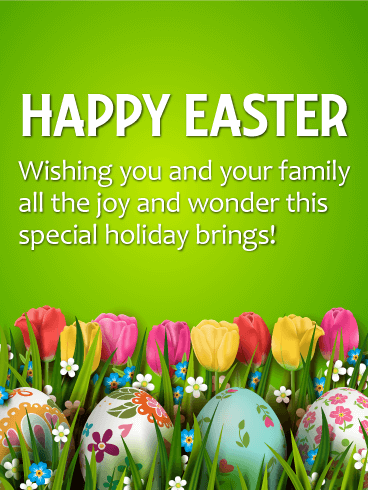 Matching pink glowing text wishes for some sweet soul to enjoy this day, it’s all about them after all! 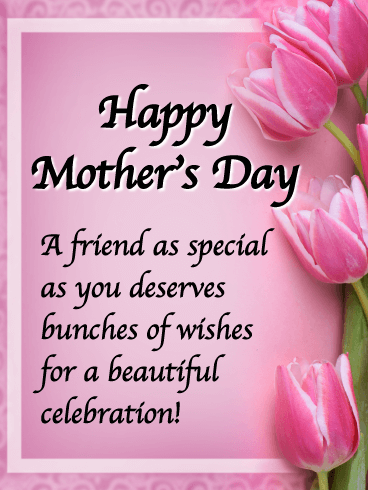 Send the Happy Mother’s Day Card to the person you feel blessed to call your friend. 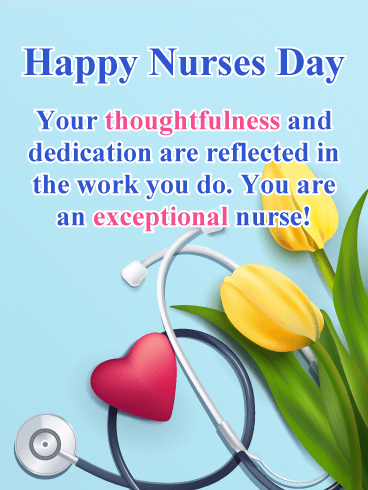 It’s sure to put a big smile on their face that you thought of them when you saw this beautiful card. 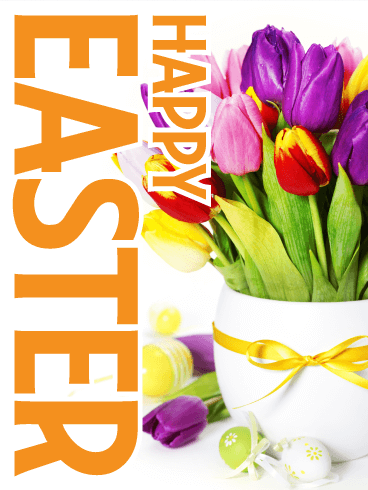 Happy Mother’s Day - A beautiful white and light fuchsia colored tulips peeks out from this card. The flowers are absolutely striking against the blue painted wood background. 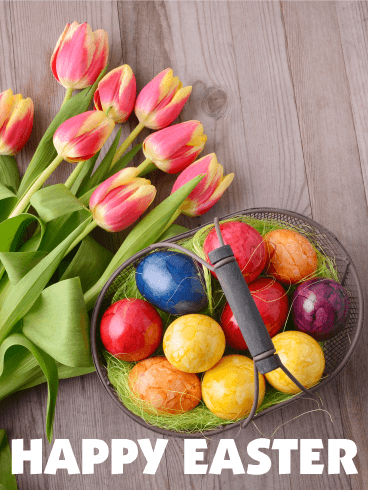 Hopefully, these aren’t the only flowers your friend receives today though! 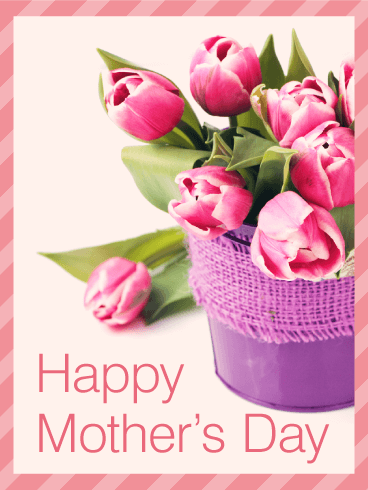 She deserves a bunch, so let her know you feel that way by sending beautiful Tulip Happy Mother’s Day Card! 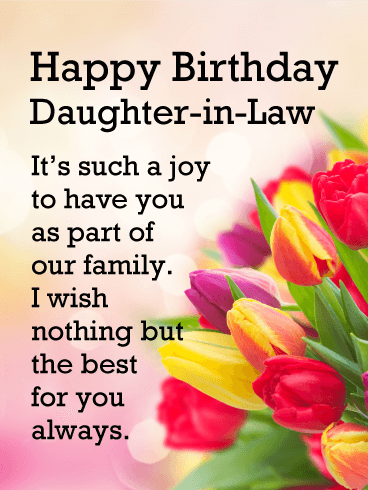 For a daughter-in-law who brings you so much joy, this birthday card is the best way to brighten her celebration! A flourish of charming and colorful tulips adds just the right touch, with light streaming through from behind. 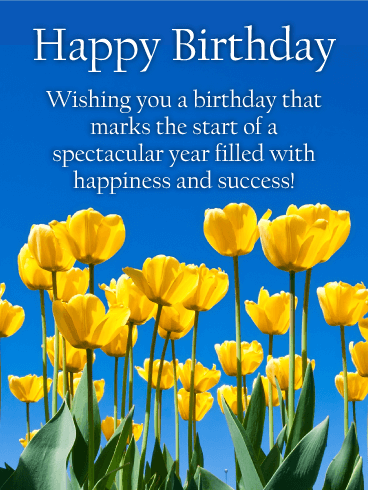 And the heartfelt words make this greeting even more special, wishing her all great things today and in the year ahead. 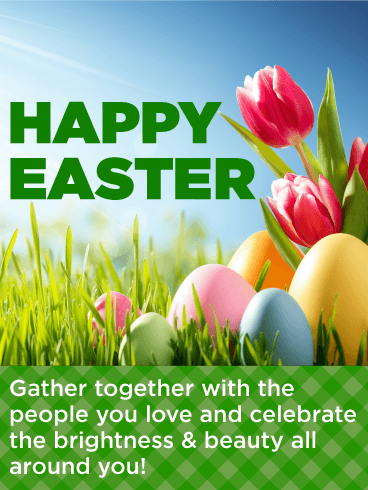 Don't you just love celebrating all those fun, national days? Well now it's one of the sweetest days of them all; National Sister's Day! Do you have one of the most thoughtful sisters around?! Return the favor and surprise her by sending this beautiful card. She won't be able to resist a smile when she sees these breathtaking, pink-tinged tulip flowers thanking her for always being there for you! What is the best way to communicate your love and adoration to the people you love most? With a beautiful bouquet of flowers! 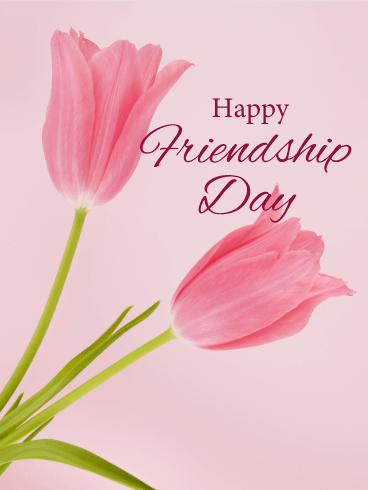 The gorgeous pink tulips on this Happy Friendship Day card are the perfect way to say thank you and I love you to your best friends. 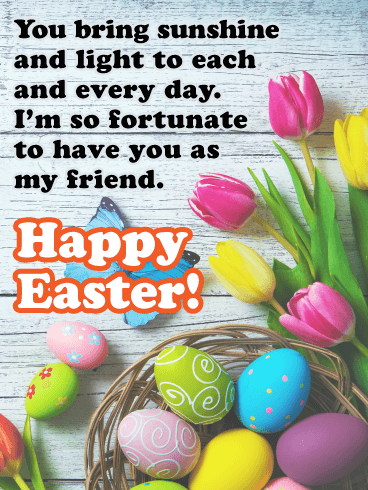 No one deserves this card more than they do, so send it to them today! 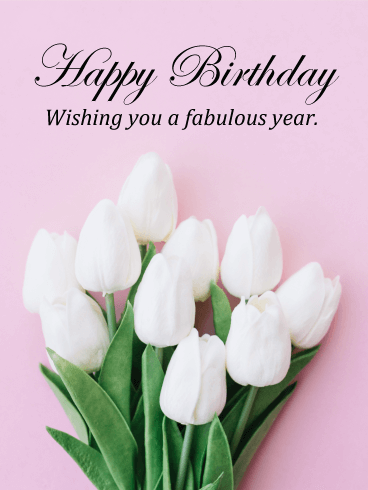 Nothing says I love you more than roses and hearts, that's what makes this birthday card so special! Your husband will be thrilled that you are sending such a kind and loving greeting card his way. The red and white roses look outstanding and the message is thoughtful and caring. It will certainly make his birthday an extra special one this year. 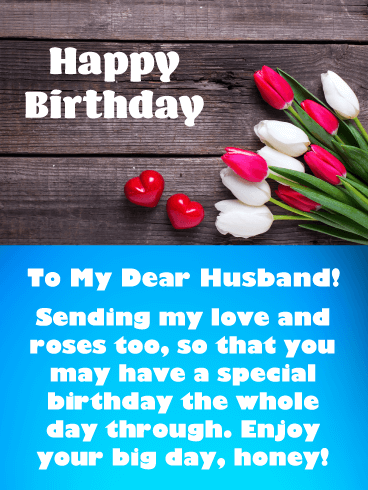 Deliver these roses to your husband without delay so that he can enjoy them today! The one person who can always make you smile is your grandma. She's been a force for good, soothing your moody days, and a source of happiness every time you need it. Wish her that same amount of joy on her birthday this year. While each beautiful tulip won't be able to compete with your grandma's soul, she'll still know how deep your feelings for her are. And that’s the most important birthday gift -love. While we might use fictional characters or celebrities as role models, nothing beats a real person to follow. And your aunt has always been the perfect choice. Smart. Beautiful. Gracious. 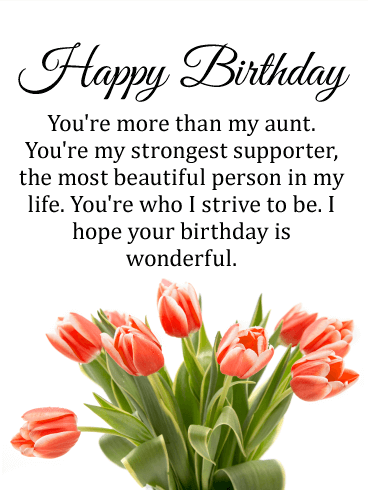 Your aunt is your compass and your rudder. She's absolutely amazing. 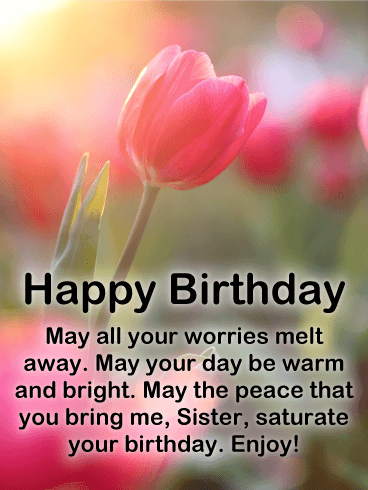 On her birthday, wish her a wonderful day and let her know how much you have looked up to her. Imitation, after all, is the highest form of flattery. And there is no one better to imitate. Today is your husband's big day, so only the best Father's Day card will do. This Father's Day card was designed to be sent by you, his loving wife. 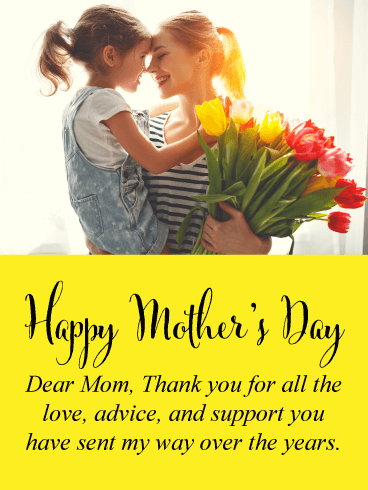 It tells him that you appreciate all that he does for your children and showcases a lovely gift box and a single flower. Perfect for the man you love. 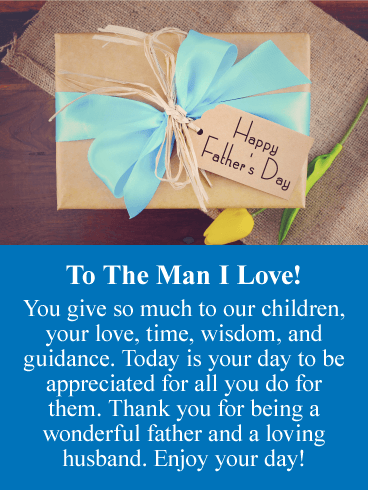 Be sure to thank him for being a wonderful father and loving husband with this exceptional Father's Day card.